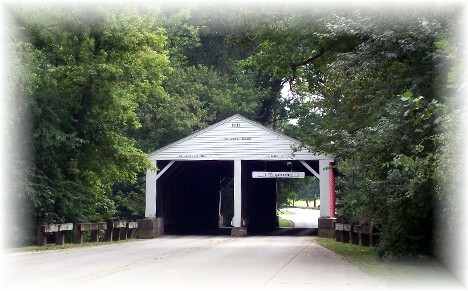 This is the first two-lane covered bridge I've ever seen! It was at the entrance to Brown County State Park in southern Indiana. Note: On Friday's message (prepared on the road) I messed up the code for this link. Click here if you would like to listen to Friday's message. Note: Today's message contains a bit more detail concerning our family than some might be interested in. The Scripture exposition starts at the second to last paragraph. This last weekend we had our 35th annual Steincross family reunion. Throughout my childhood the Steincross family gathered at my grandparents' house in Harwood Missouri, but I don't remember ever calling it a reunion at that time. Following their deaths in the early seventies their offspring established the annual Steincross family reunion which was an idea of the oldest and only son Gentry. He had a concern that the family stay together though we had spread all throughout the U.S. Brooksyne attended the very first one the summer before we were married (the local small town newspaper wrote about our reunion and said we were engaged though we had not even spoke of marriage at the time). Last fall my Aunt Frances, the youngest Steincross child, and the last living from that generation passed away so this year's gathering was one less generation. Thirteen of the sixteen cousins (my grandparents' grandchildren) were able to attend. We are now all over 50 and of course there were many from the succeeding generations in attendance as well. 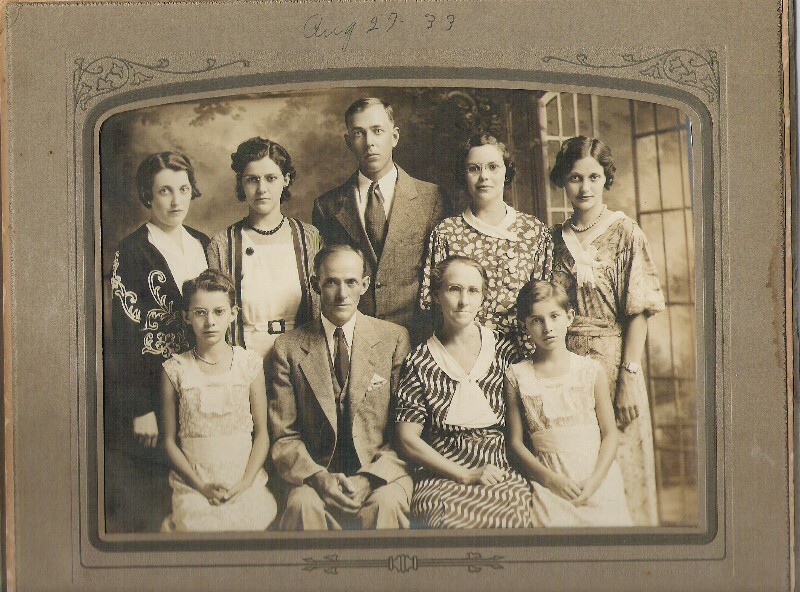 I found this family photo taken in 1933 when going through my mom's belongings after she passed away five years ago (enlarged photo). My mom is at the lower left in the photo, the second youngest child. Aunt Frances, who passed away this last fall is on the other side in the front row. My Mom was 12 years old at the time of this photo. My grandpa was 51, younger than I am now. He was a farmer and the president of the only bank in tiny Harwood Missouri and a vibrant, colorful man. As a young man he traveled across the west on rails and climbed Pike's Peak one night. On each birthday well into his eighties he rode a bike to assert his youth. I assume I get some of my personality traits from him. I sure hope so! My grandmother was a quiet woman but my spiritual heritage can be traced back to her and the little white framed church she attended. She and Grandpa had 65 years of marriage as I recall. "Generations come and generations go." A multi-generational family reunion especially underscores this, especially if you get together regularly. Year after year one generation goes and new babies take their place. Several years ago there was a popular ad series that had the line, "Life comes at you fast." Actually looking at the photo sure underscores that life not only comes at you fast but goes by very fast as well. We all need to regularly examine ourselves and do a thorough check to see how we are living our lives. Most certainly "Generations come and generations go." A question that we should all consider is "How am I living today in light of eternity and what legacy will I leave for those who follow behind?" Daily prayer: Lord, in the looking glass of Your Word, may the choices I make this day honor You and also honor my family name. I choose a good name above riches, prestige or fame. I pray that I would reflect the good character that comes from following Christ to my present generation and that it would be passed on to the generations that follow, for the glory and honor of Your Holy Name. Amen. 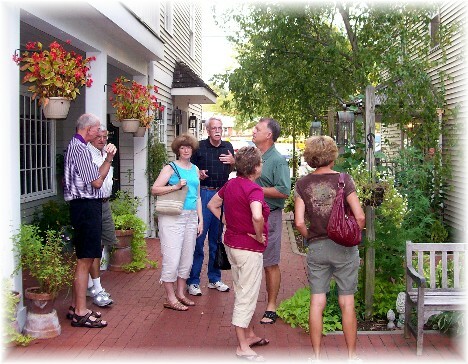 A photo of some of some of my cousins outside of the "Artists Colony" restaurant where we ate in Nashville Indiana. My cousin Dub and his wife Joy in front of a church parking lot sign in Nashville Indiana. They had an interesting experience at the reunion. 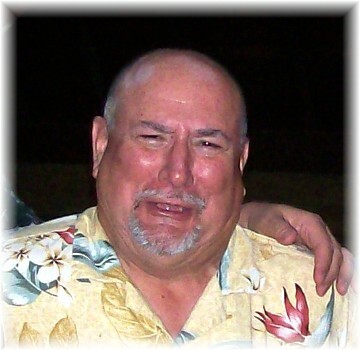 Dub is a retired minister who attended seminary in Louisville Kentucky about 100 miles south. Forty-eight years ago they came up to Nashville with their infant son and had dinner in a restaurant. While in the area for the reunion they reminisced as they attended the very same restaurant and sat down at the very table where they sat forty years earlier. The very next day the restaurant closed down due to lack of business! Their timing was perfect. Brooksyne's Note: Stephen's brother Mike had a hankering to visit a limestone quarry near Bloomington Indiana. We went back a gravel road and saw a quarry that appeared to be a strip mine filled with water so we did a little exploring. Stephen saw this giant old piece of equipment and couldn't resist climbing up in it (that's him "driving"). His niece Greta and her family along with Ester posed for a photo at the foot of the tractor. As I was taking the photo an official truck came through, pulled over toward me and said, "You know you're not supposed to be here, don't you!" We were unknowingly trespassing since it was a "superfund" site. We should have realized the signs posted in various places were meant for us (even though a local person sent us to this site - he must have had a good laugh after he sent us off exploring). We felt pretty foolish during the photo shoot as we were scolded like school children. We certainly didn't make it known that we had two preachers (Stephen and his brother Pat) breaking the law right along with the rest of us "hardened criminals". We learned that we could have gotten into a lot of trouble, so we're thankful for the mercy extended to us instead of their applying, "Ignorance of the law is no excuse". 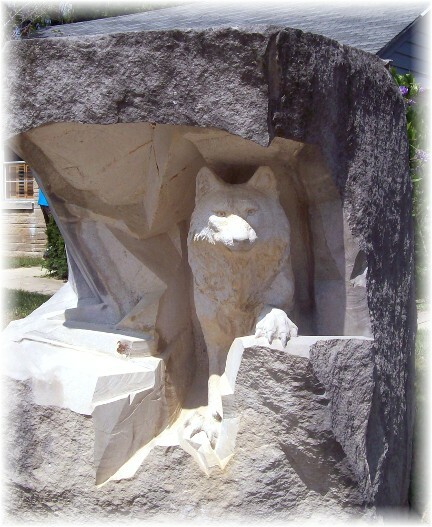 Bloomington, Indiana is renowned for its high quality limestone. 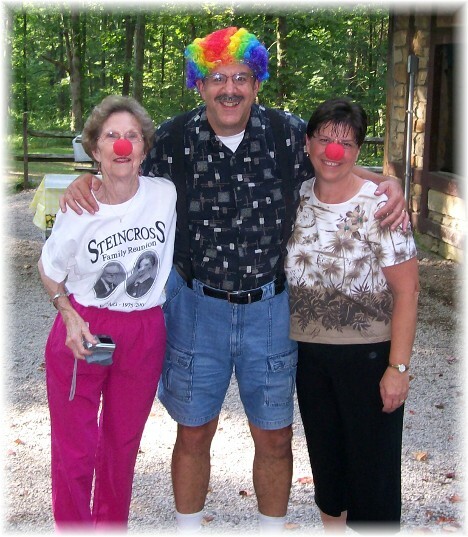 Saturday night was "Carnival Night" and so the host family distributed some clown wigs and big noses to clown candidates! Pictured with us is Jeannine Fisher, cousin from Tulsa, Oklahoma. "Pat Weber says, 'Be Encouraged Today'". 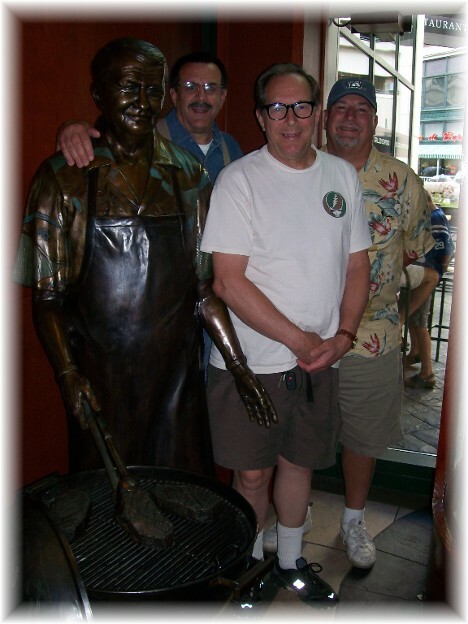 The Weber brothers along with the replica of George Stephen, founder of the Weber Grill, at the Weber Grill Restaurant in Indianapolis, Indiana. "The Family Of God" Video This tells the story of the Bill Gaither song many of us enjoy singing titled, "I'm so glad I'm a Part of the Family of God." Note: We returned to our home in Mount Joy late last night after our six day vacation and reunion in Indiana. We were unable to post messages the last two days.